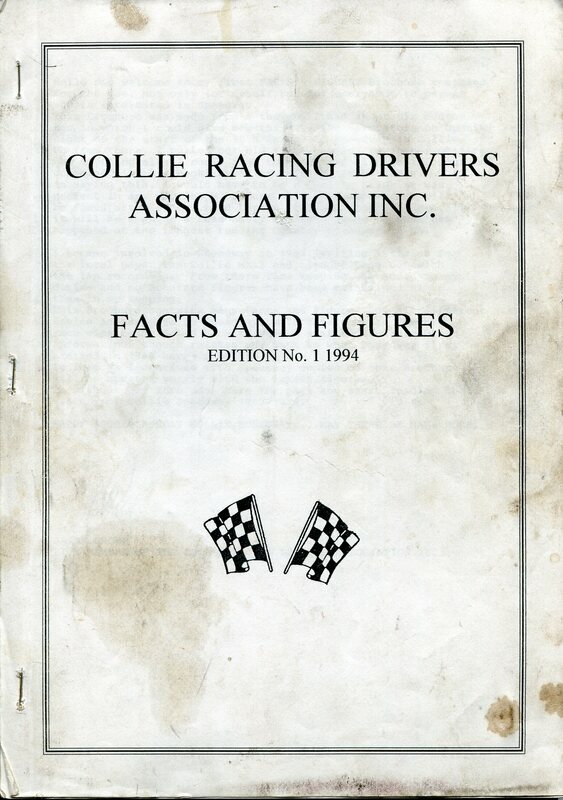 In 1932 the Granville Showgrounds that was used as a Horse Trotting track was transformed into a speedway track, The track hosted Motorcycle, Sidecar and Midget racing up until it closed in 1936, The reason for the closure was put down to a poor safety fence after bad side car accident, It wasn't until 1977 when speedway would re-apear at the showgrounds under the name of Parramatta City Raceway. Formerly know as Granville Showgrounds Speedway, Sid Hopping was the main man behind the Speedways inception and opening in January of 1977. 1977 - Bob Blacklaw rolls around the new Parramatta racetrack Photo: Allan Baker collection. 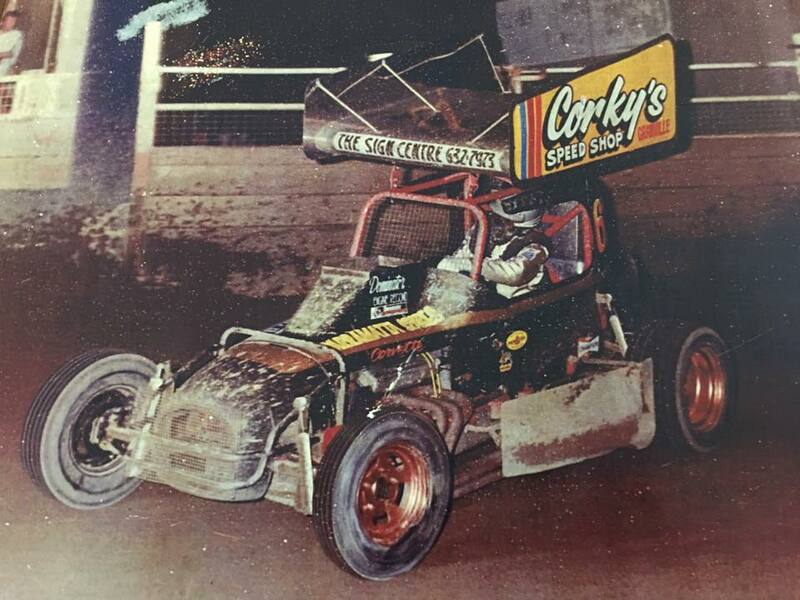 1977 Kel Young winner of the the first Modified Sprintcar race at Parramatta Raceway. 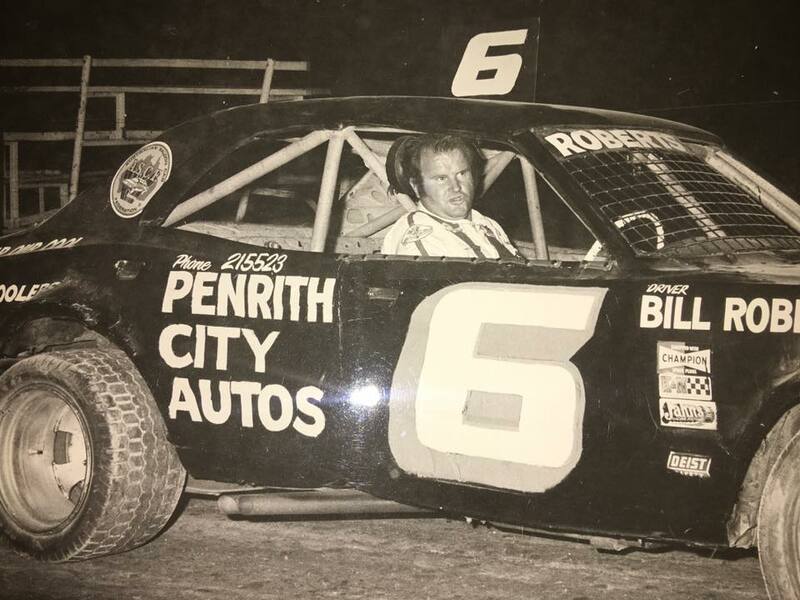 Photo: Nostalgia Speedway Association of NSW inc.
Sid a previous side car champion from the sixtee's had retired from competition and taken an interest in filming sport for television news. After a period Sid returned to Speedway Competition this time in the Supermodified ranks at which he truly excelled. Sid along with his partner Bert Wilder operated the speedway until 1987. 1977 - Brian Callaghan pictured in Bill Roberts senior's Cortina - This was Brian's first A Main win at Parramatta. Photo: Lance T Wilson. 1978 - Garry Rush Australia 1 leads Sid Hopping in the number 100 Batmobile. Photo: Lance T Wilson. 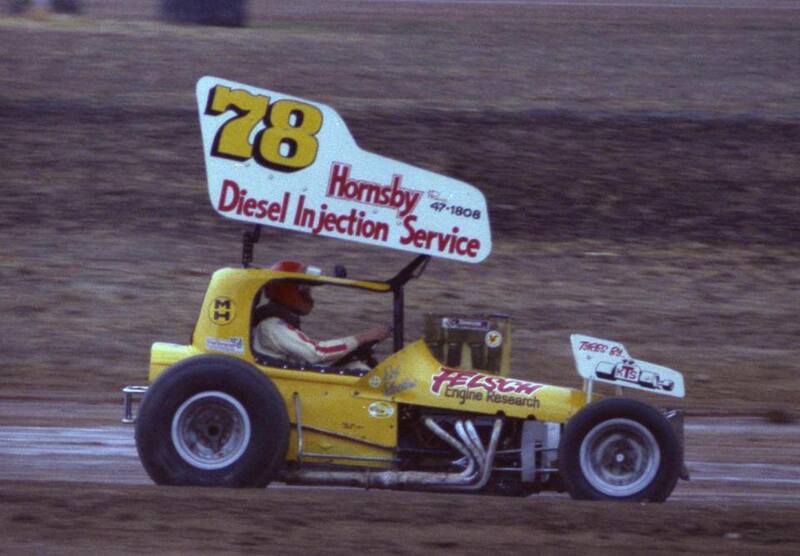 1978 - Gary Rush worked out the best way to win races was to race the best equipment. Photo: Lance T Wilson. 1979 - Martin Laughton and Brian Beckingham both from West Australia in the pits at Parramatta. Photo: unknown. 1982 - Bill Sutherland was just one of the West Australian champions to race at Parramatta. Photo: unknown. The venue was then sold to Bob Ruttley who made major upgrades to the Speedway before selling out to Gary Rush in 1989 who introduced David Lander as a partner shortley after. 1989 - Jaymie Moyle tears up the Parramatta raceway in his number SA69 Throstle. Photo: unknown. After David's introduction to Parramatta through Gary Rush in 1989 within the same year he would have sole ownership of the Venue, he would go on to gain a reputation as a hard worker and inovative,Lander would introduce big prize money events that would attract the big name drivers and in turn the venue would fill with paying spectators, as well Lander broke new ground with television, so much so we saw the 1st ever live to air broadcast of a Sprintcar National Tital. Lander would sell the Speedway in 2001 to an International group. 1992. Robbie Farr on the outside of Bob Tunks. Photo: FRMedia. 1992. John Shore. Photo: FRMedia. 1992 Marty Perovich. Photo: FRMedia. 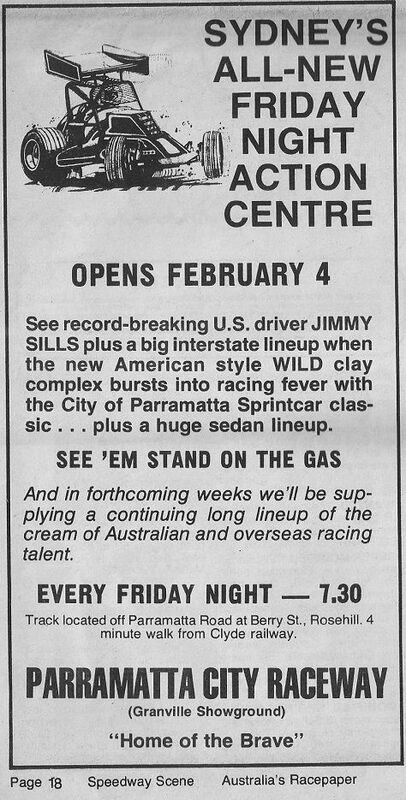 Parramatta City Raceway hosted the 1993 - 1994 Australian Speedcar Championship on the 28th and 29th of January 1994. This group was headed by ex pat Australian Brian Heatley and American Bob Spence, unfortunatly in 2009 Spence died and the Speedway was up for sale. 2001 - Ron Pyne in the 7 Commodore moves under Allan Baker in the AU Falcon. Photo: unknown. 3rd November 2001 Feature - Mick Goode - Brooke Tatnell and Max Dumesney. Photo: unknown. 2004 - Linda Versperman captured this magic shot of Sammy Swindell at Parramatta on his first trip to Australia. Parramatta Speedway hosted the 2015 - 2016 Australian Speedcar Championship on the 5th and 6th of February 2016. Parramatta Speedway hosted the fifty fifth running of the Australia Sprintcar Championship on the 26th of January 2017. 2017 - West Australia's Road Race Champion Garth Tander jump behind the the wheel of Max Dumeseny's open sprintcar and turned in some hot laps at Parramatta Speedway. Photos: Gary Rogers Motorsport facebook.